A nightmarish hellscape lays before you. Gore and viscera line the walls. The broken husks of what used to be human beings scatter the scene, crying out in despair. The terror of your surroundings overwhelms you. 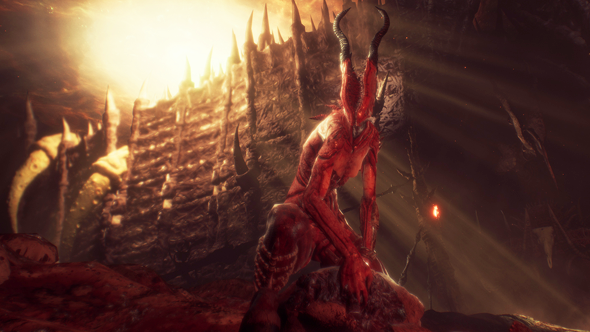 But enough about the PCGamesN office, let’s talk about the first-person horror game, Agony. When Agony was first revealed by developer Madmind Studios it conjured up memories of Hatred – the shock-value murder sim that made the headlines a few years back. But while Agony may rile up evangelical Christians the aspirations of its team go beyond crudely igniting outrage. The grotesquerie of Agony’s world hits you immediately. Looking for a fright while you wait for Agony, here are what we think are the best horror games on PC. Based off my first few hours with the game, Madmind’s vision of hell is one part HR Giger, the other part death metal album art brought to life (with a dash of Doom thrown in for good measure). The late Giger’s fascination with sexual organs is present here, with just about every piece of scenery bearing some kind of phallic or vulvic imagery. There are shades of David Lynch’s twisted work in here too, as you explore the fleshy labyrinths of Agony’s depiction of hell in pursuit of a demonic femme-fatale referred to as ‘The Red Goddess’. Despite a dedication to grossing you out, Madmind don’t seem to take their narrative all too seriously – it is merely the hook that pulls you through the pulsating red caverns of flesh. Hell is the last place you’d expect to find conversation that is more tongue-in-cheek than anything else. And yet the eternally suffering characters you meet scampering about in the dark is delivered in such a way that it drew more than a few genuine laughs from me. While Agony is able to consistently deliver gruesome surprises for your eyes and ears around each corner the same cannot be said for its gameplay. It plays as you’d expect for any Outlast-style survival horror game: explore environment, find keys (in most cases, skulls, hearts, or another part of the human anatomy), and then try to avoid enemies as you head for the next area. And let’s talk about those enemies for a sec. I mostly encountered large-breasted demons whose heads have a mouth that resembles a Venus flytrap. Yuck. 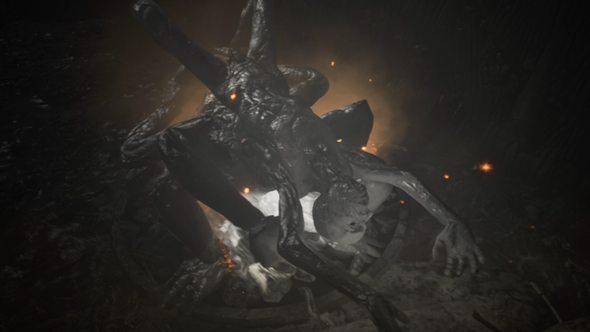 Fortunately, for my nerves, direct combat is minimal as you are armed only with a torch – no sign of the kinds of flesh-guns that feature in similar body-horror title Scorn. Sure, you are able to swing your flaming torch at enemies, but don’t expect that to keep you alive for long. Instead, Agony urges you towards practising stealth, at least in the early portions. In this area it is disappointingly basic and not particularly refined. It’s most distinctive feature is that you can keep ALT pressed to hold your breath, allowing you to move quietly at the cost of your speed and stamina. However, the game does a poor job of communicating where you are in relation to the foul demons stalking you, which led to many an instance where I was leapt on unexpectedly. It made for a cheap jump-scare but was more memorable for the frustration that followed as I was dumped back to the latest checkpoint. There are also puzzles to solve. Again, these are not gonna light your guts on fire as they follow a simple pattern: find rune, find another rune, put rune together, complete rune. Job rune.. uh… done. 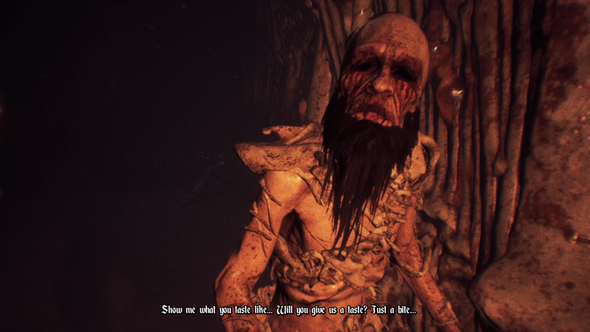 One aspect of Agony that does make it a little different from the survival horror pack is ‘Agony mode’, which is a game type that will see you exploring procedurally generated flesh dungeons, giving you a unique experience every time. Unlike We Happy Few, Madmind is being wise to not hang Agony’s hat entirely on this mode, instead presenting it as a substantial extra to those who have suffered through the story mode. 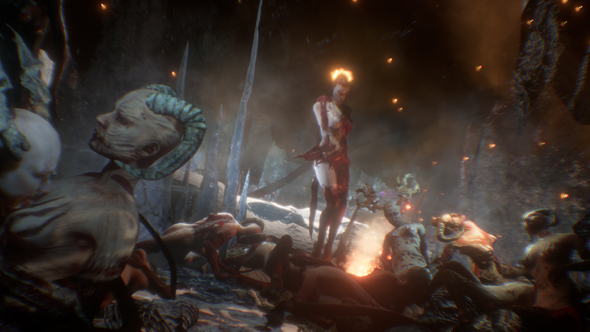 Agony’s most impressive achievement by far is its world.If you’re looking for a lovingly-crafted and gory horror experience, you will adore Agony’s aesthetics, just don’t expect the same from the rest of the game. Probably avoid playing it when grandma is around, too. Unless your grandma is a hell-demon, I guess.